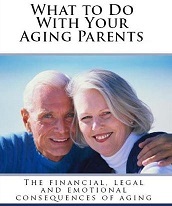 Do you have an aging parent or relative? Here is what you must know and do. Many of life’s most important decisions are made in the waiting room instead of the living room! This 70-page book tells the story of Marilyn who has an elderly mother living alone in another state. While she is cooking dinner the phone rings. Her mother’s neighbor is on the phone explaining that she just put Marilyn’s mother in an ambulance and believes she had a stroke. Are you prepared for this call? Few people are but the day will come. This book is packed with great information, conversation starters and most importantly a checklist of things you must have access to and their location. Don’t wait for crises. The checklist includes doctors’ names and contact details, current conditions, medications, dosages, legal documents, account numbers and more.